What Songs Should Ken and Lisa Theriot Perform at Gulf Wars 2015? We need your help putting together a set list for the Ken and Lisa Theriot concert at Gulf Wars 2015 – Tuesday, March 17th at 8:00 pm. This show will not be an album release, so the songs will be a blend of those from both Ken AND Lisa Theriot albums. 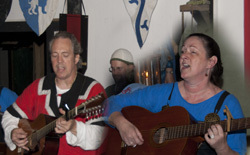 We’ve assumed that certain songs are mandatory, such as Agincourt, Band Of Brothers, and The Feast Song from Ken’s repertoire, and Harvest, Seek The Reaper and Tomorrow (from the upcoming “A Thousand Nights and a Knight” album) from Lisa’s. But there is nothing like hard data to make sure. You can listen to clips from the current albums below. There is a player for Lisa’s songs and one for Ken’s. There is only a limited amount of time for the show, so we can’t absolutely guarantee that every song picked by everybody will make it onto the set list. We will choose the ones with the most votes by the most people to fill out our time-slot. You can “vote” by leaving a comment below. In case it isn’t clear, we want you to vote for a song EVEN IF (especially if!) someone else has already cast a vote for it. Treat it kind of like an election:). So if you plan or hope to be at Gulf Wars in March, and will be at the concert, please let us know – via that handy comments section below – which of Ken’s and Lisa’s songs you would like to be sure will make it onto the set list. That will help us out greatly. BTW, we will also be playing songs over at The Feast Hall on Sunday Night (Mar 15th) during dinner from 6:45 to 7:30.